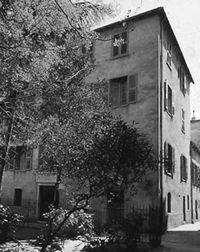 The Bonaparte family home in Ajaccio was a large four-storey building that proved comfortable for Napoleon his brothers and sisters. All, but Joseph, were born on the first floor of the house. In 1793, the family members left Corsica because of their pro-French political leanings and it wasn't until 1797 that his mother Letitzia returned. The house has been enlarged and refurbished several times in its history and is now a museum. Visitors can get a glimpse of 18th Century Corsica in a display and tour the rooms that the children shared. Also on show is the room Napoleon is said to have stayed in for the last time on his way back to France from Egypt. There are many other historical and family displays within the museum dating from before Napoleon's rise to power right through to the Second Empire and Napoleon III.